I have written about this idea of a woman at her toilette before here. 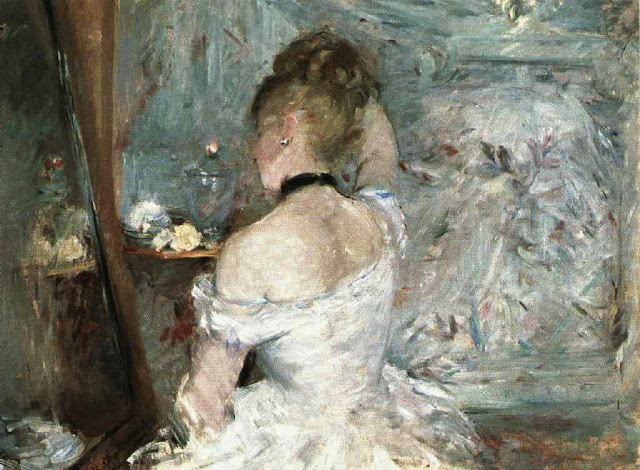 I reflect I may have been influenced not only by watching my mother apply makeup when I was a little boy but also because I have been fascinated with Berthe Morisot’s Woman at Her Toilette since I can remember seeing it sometime in the late 70s. I first photographed the very beautiful blonde-haired Cheri in the late 70s and then for the last time in 1995 in my Robson Street Studio (corner with Granville Street). I asked her to get ready for the photographs and to apply makeup by the antique mirror I had there at the time. While I took the photographs after this with my large camera I chose to use my Nikon FM-2 loaded with Kodak B+w Infrared Film. To shoot this film one has to place a deep red filter in front of the lens. Curiously one must focus and then unfocus the lens to where there is a little red mark (not found in modern lenses). The effect is grainy but ethereal.